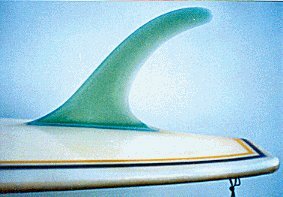 1967- 1968 Gordon and Smith, Vee Bottom 7 ft 7"
Stringerless foam blank with volan glass, knee patch, wide resin pinlines. 11 1/2" x 11" base 16'' span @ 9 1/2''. 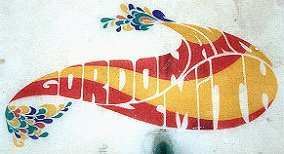 Gordon and Smith multi colour paisley at pod. small red/black rectangle at nose. Purchased 1985 with snapped fin. Fin repacement by Jackson Surfboards, 1995. Template reconstructed from remnant fin base.by Geoff Cater. Offered for sale at Mick Mock's Sydney Surf Auction, Mona Vale, October 2005. Catalogue # 252 : 7'7'' c.68 Vee bottom, clear with thick pinlines black/yellow on bottom 8/10. I recently purchased the G&S vee bottom stubbie shown in your register as #26, evidently latest history update ( Mick Mock) is that the board was shaped by Floyd Smith during a visit to Australia. I also have a Shane mal which is number 160, much the same as #159 in the catalogue but with the original reverse dorsal fibreglass fin, I bought it from the original owner in 1978 for $50. Keep up the good work on the site, I am a great fan of vintage surfboards and the history that surrounds them." Shapers details for #26 (previously 'Unknown') have been updated. "I saw a v-bottom Gordon and Smith board in your catalogue (#26). I had one which I purchased from Steve Ash while at Noosa in about 1968 (Feb) which he had bought from Keyo (Surfboards, Brookvale). It was roughly 7 1/2 feet and went very well in the 6' surf at National Park at the time (and uncrowded maybe 10 surfers max). I cannot remember what happened to it." Given the board was purchased second hand in February 1968, Ian's recollection is confirmation that boards of this design and dimensions were common in Sydney before the end of 1967. Many thanks to Ian for his contribution. Usually only one decal, placed on the deck, at either sweet spot.- note this example has unusual decal placement. #115 1967 Wallace, Vee Bottom 7 ft 8"
Footage of Windansea Contest October 1967, Palm Beach. Various locations, Manly and NZ with Bob McTavish and Wayne Parkes. Footage at Lahina Harbour and Honolua Bay Maui. American interpretation of the Vee bottom design. 4. Nat's Nat, pages162 to166.